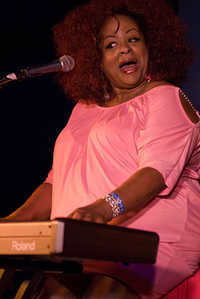 Lady Bianca (born August 8, 1953) is an American electric blues singer, songwriter and arranger. She has worked as a session singer, depicted Billie Holiday on stage, and since 1995 released six solo albums, three of which were nominated for a Grammy Award. She is currently based in Oakland, California. This webpage uses material from the Wikipedia article "Lady_Bianca" and is licensed under the GNU Free Documentation License. Reality TV World is not responsible for any errors or omissions the Wikipedia article may contain.